On this machine, you'll need to remove a couple screws from the bottom before you can get to the clutch. Lay the machine face down on a thick towel. 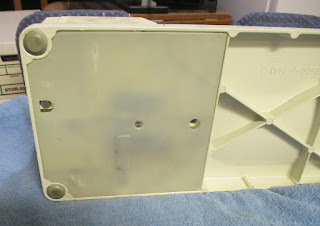 If it has the plastic shield across the bottom, remove the screw and take the plastic shield off. Directly below the handwheel, on the bottom of the machine is another long screw. Remove that screw, and the end panel will come off. Next, you need an Allen wrench, size 5/32 or 4mm. 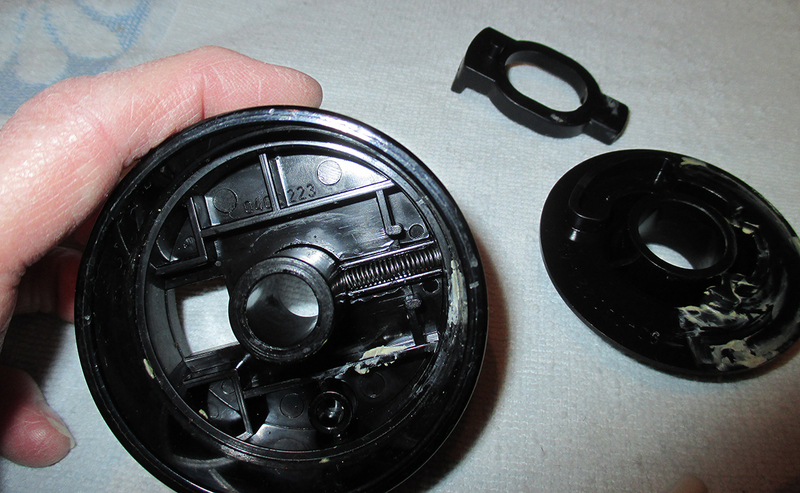 There’s a black screw that the Allen wrench will fit into, just above the pulley. Turn it to the left, just enough to release the tension on the pulley. Now you can take the handwheel off. 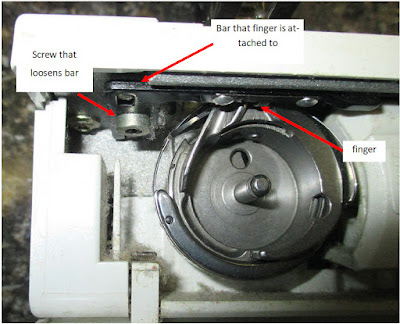 Loosen the little screw on the center knob. Unwind the knob and take it off. Lift up on the pulley as you remove the handwheel. 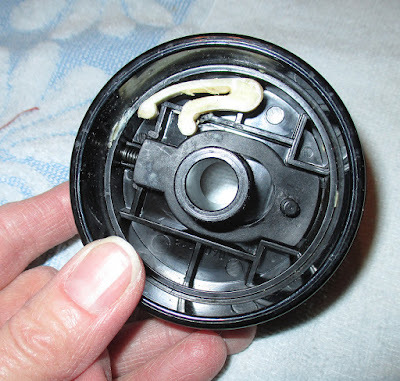 Spray a little WD-40 on a rag and clean inside the handwheel center hole. Spray some on the shaft that the handwheel goes onto, and clean it off with a rag. It may take 2 applications if it’s really frozen up. Make sure all the WD-40 is removed, then put about 3 drops of sewing machine oil on the shaft. 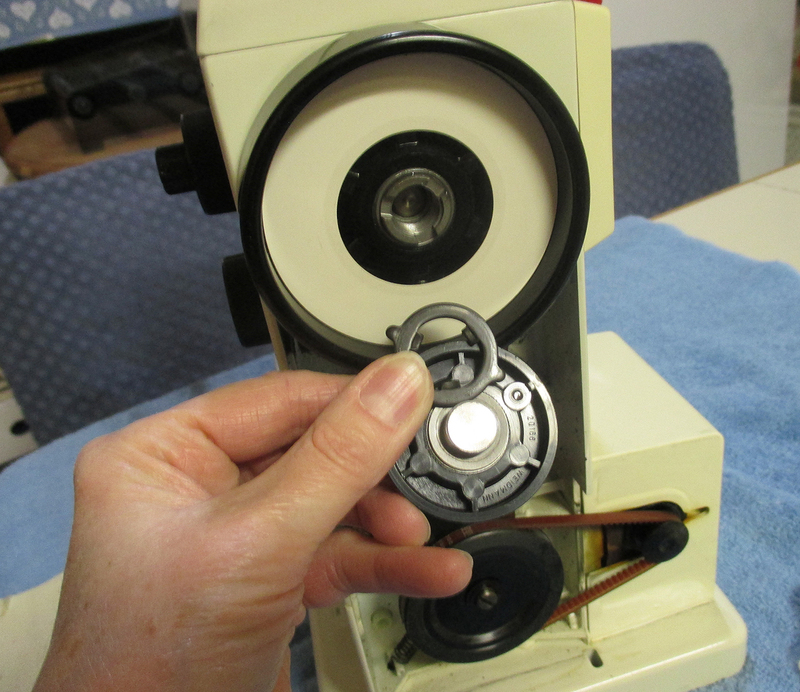 Put the belt onto the handwheel and make sure the belt is also seated in the inside groove of the pulley, then push the handwheel back on. 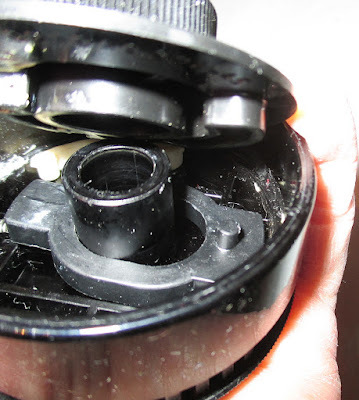 Replace the metal ring with the nubs facing outward. You have 3 positions that the ring can go on. You’ll know you’ve got the right one, when the clutch will release, but it will also hold it locked for sewing. You have to have the center knob all the way on before you can check. I couldn't find a picture on the internet, so made a pdf from a parts catalog. It's not very good, but it's all I've got to work with at the moment. 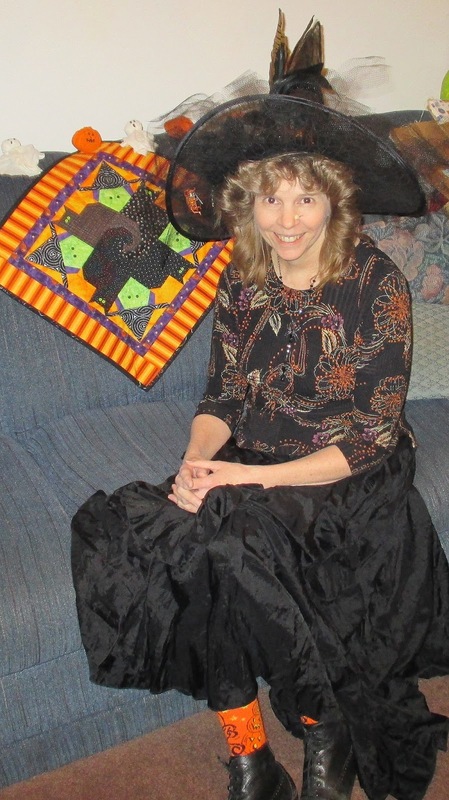 I've been out with the neighborhood ladies at the annual Witches Night Out. We went to Kneaders to have dinner and desserts. And I won a lovely, metal spider in a web, that I can hang on my front porch. I had to get out my special hat and wart, just for this special occasion. I got a great suggestion from Patti, who suggested that we could use a fingernail file BUFFER instead of fine sandpaper. I think that would work very well! Just use the finer side, as the courser side might leave scratches. I'm not a fingernail girl, so it's a good thing Patti corrected me. This should be a "fingernail buffer," not a "fingernail file." Here's a link to a picture on Sally Beauty Supply. 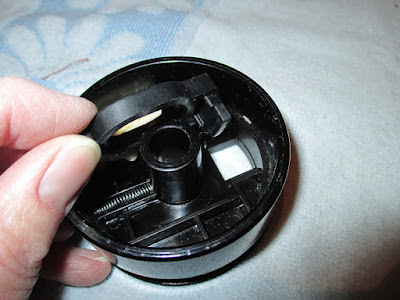 I got a question this morning about how to put a Pfaff bobbin winder clutch back together. 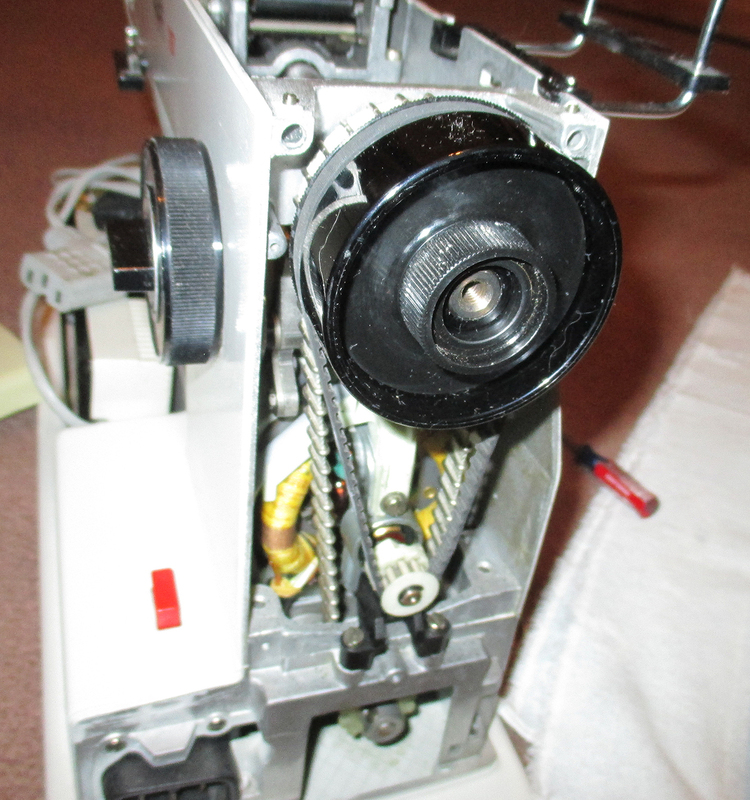 I happen to have a Pfaff 1197 at home, so I've taken it apart, and here's how to put it back together. I've taken the top of the machine and the side panel off. Then unscrew the plastic screw in the center of the knob. Work the outside belt off so you can remove the knob. Here's what the knob looks like inside. 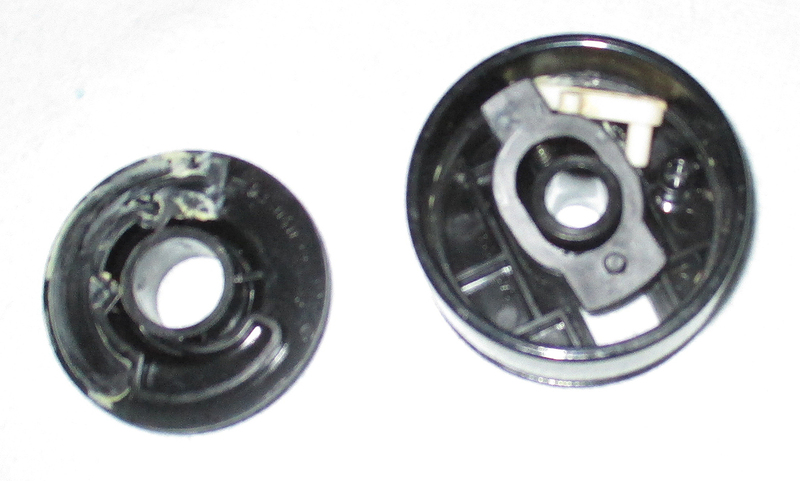 There are 2 black plastic knob parts, one black part with an oval hole, one white part and a small spring. The first thing to do is to put the spring in place. It just sits in the little trough that is molded to just the right size. Next, put the white plastic part in. 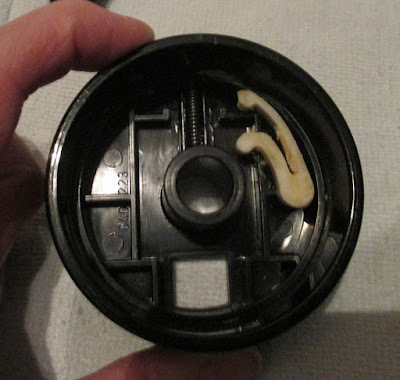 The white part has a post on the underside that fits into a small round hole. Then put the black part with the oval hole onto the center shaft. 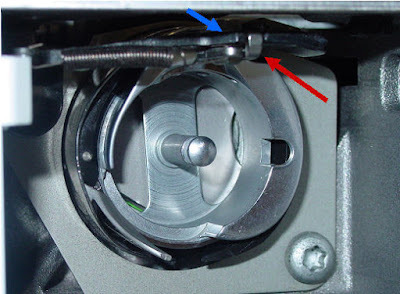 The protrusion will go into the square hole in the handwheel. Now position the white part so it rides on the outside of the black part. Then put the center knob on top, with the black post going into the curved trough on the knob. Hold the parts together as you put it back on the shaft. Then put the belt back on. 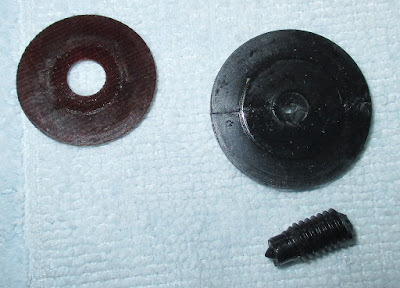 Put the washer on the plastic screw, and carefully screw it into the shaft. Don't tighten it too tight, or you'll break the screw off. Dang! It's a good thing I can get a replacement part #0401655-BSCREW Pfaff Hand Wheel Black Plastic. Retail on those is about $6. It sounds like there’s something caught in the bobbin/hook area. “The shaft” is called the “hook.” I believe your machine has a rotary hook system, so the hook doesn’t come out. You need to take the needle plate off and look at it from the top. Rotary hooks tend to get thread tangles behind the hook. If there are thread tangles, remove them. At the shop I use tweezers and a hooked seam ripper (Havel’s). Another thing that happens with rotary hooks is the retainer finger comes out of position. There are 2 parts to your hook. One part should turn around, and the other should stay stationary. The stationary part has a little finger to hold it in place. I’ll attach a picture so you can see what I’m talking about. The red arrow is pointing to the finger and the blue arrow is pointing to the retainer. One more idea… The pointed part of the hook can get damaged. You can feel it with your finger. If it’s got burrs on it, you can gently polish it with very fine sandpaper (400 grit). Great videos! The thread passage is too tight, or the finger is damaged. So first, try adjusting where the finger goes into the retainer. The finger needs to pull out, away from the machine a little bit. If you look up, under the needle plate, you should see a way to adjust the finger. With some it’s a nut that gets loosened, with others it’s a little screw. The retainer should just barely hold the finger in place. If the finger is damaged, you can try to take it out of the machine and polish it with a very fine sandpaper (about 400 gritt), then put it back in. However, if it’s severely damaged, the finger should be replaced. Any rotary hook will make a little noise every time it makes a complete rotation. What happens is the retainer will move back and forth on the finger. As it touches the finger, it will make a little “tap” sound. 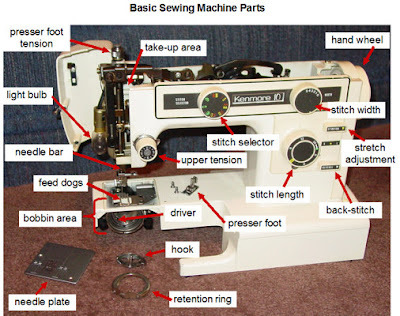 I was just asked about what sewing machine a serious beginner should buy, for less than $250. It needs to be a good, durable sewing machine, that will grow with skill level. 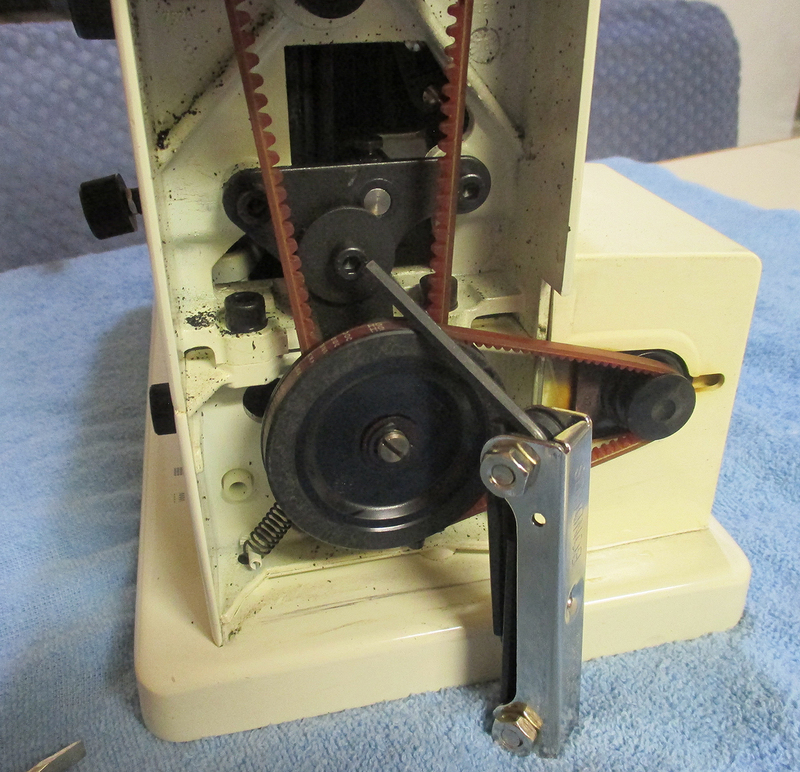 To get a new machine that would be more durable, you’d need to spend at least $700. 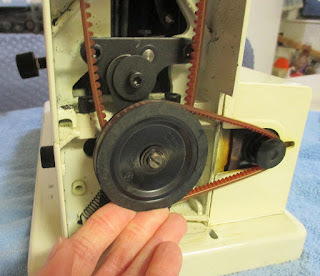 There are a lot of new machines that have lots of bells and whistles, but they all have a plastic bobbin case, that can cause a lot of frustration. You might want to look on Craigslist.com, and see what used machines are available in your area. For new sewists, I recommend an old Kenmore 10 stitch, or something similar. I LOVE the old Kenmores! And you can usually find one in a thrift store for less than $25. Some only have straight and zig-zag stitches, with a door on top to add cams. You don’t want that, you want one with built-in cams/stitches. You also don’t want the old, top-loading Kenmores, as that bobbin/hook system is a nightmare. You want a front-loading machine with all metal hook and bobbin case, and a few extra stitches built-in. If you've got your heart set on a "NEW" machine, Try a Singer "Simple." It has the metal oscillating hook and some nice stitches. Most people only use a handful of stitches. The ones most people need are straight stitch, zig-zag, blind hem and serpentine (or broken zig-zag). If you’re a quilter, you need the blanket-stitch for applique. And a nice decorative stitch or two is good. 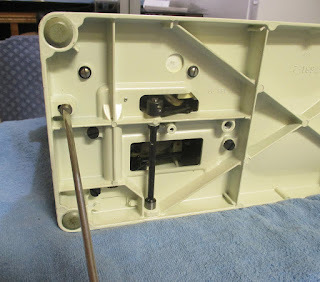 If you’re sewing heavy fabrics, you need a front loading, metal hook and bobbin case. The plastic bobbin cases jam when you sew heavy fabric, and the needle goes right through them. Then you have to buy a new bobbin case. If you’re doing light sewing, like piecing a quilt, a cheap plastic machine will work just fine. The auto thread cutters (under the needle plate) seem like a good idea, but they haven’t been perfected yet, and can cause a lot of grief. 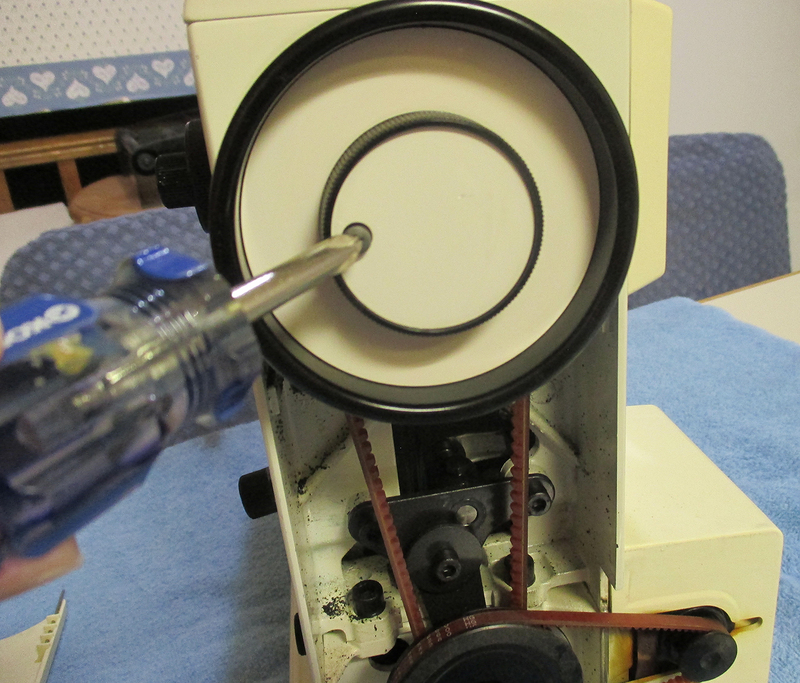 To check the quality of a machine, grab the needle bar and try to wiggle it forward and backward. If it has forward/backward wiggle, the needle hook distance (a timing setting) is variable and you’re not likely to get as good stitch quality.